Did you know two webinars are also included with purchase of Vicki Ronchette’s Mentor Program? 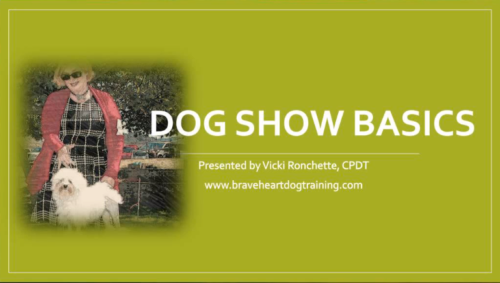 Webinars are a great way to help clients who are out of the area but are looking for help with training their show dogs. Our live webinars are usually about one hour long with another 30 minutes at the end for participants to ask questions. Please note that after purchase, recorded webinars may be viewed at any time and may be viewed more than once. This webinar contains parts One and Two of Vicki's From Shy to Showy webinar. 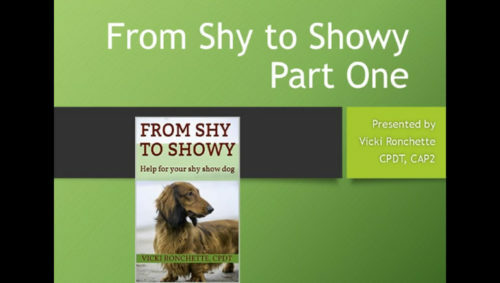 This webinar was designed around Vicki's book and workshops that focus on how to help shy, fearful dogs. 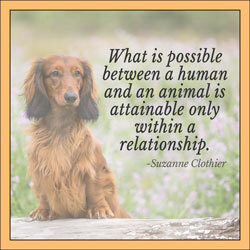 Written for show people, but beneficial to anyone living with a fearful dog. Also helpful for dogs who simply don't enjoy showing that much. Covers how to identify stress signals, fear, shyness and how to work with dogs to get them more comfortable and relaxed. Take your dog from Shy to Showy today! You will not believe what a difference a Show Stopping Stack can make in the ring! 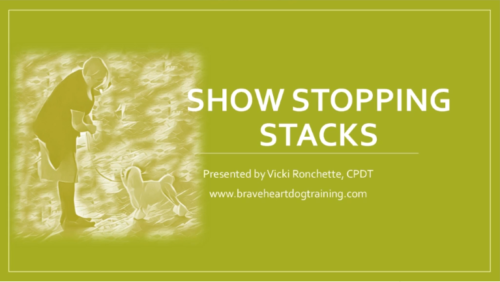 Whether you are just starting to teach your dog to be hand stacked or you are just looking to take your stacks to the next level, this webinar is for you! Vicki will discuss how to train both the hand stack and the free stack and will go over ways to increase duration and make your free stack extra showy! Learn to train your dog to show off everything they have! Never be caught off guard in the show ring again! Whether you are new to showing or are a seasoned handler, you may still be surprised at some of the curve balls that can come at you in the show ring. This webinar will help to prepare you for the things that may come up that you didn't even know were possible and help you be ready for anything! Do you have a new puppy that you are just getting started with? Are you unsure of where to start and how to begin your training journey? 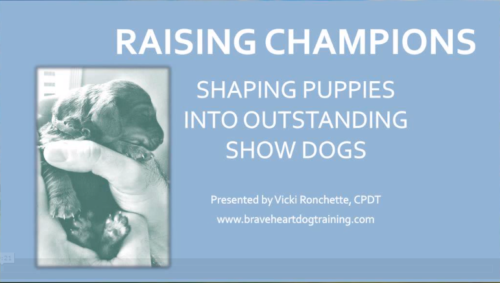 This webinar will teach you where to start, the best ways to begin training, how to keep it fun and engaging for your puppy and how to teach the behaviors needed for the show ring. Socialization and puppy raising issues will also be discussed. If you have a new show puppy, this is a webinar that you won't want to miss. Get the best movement from your dog! 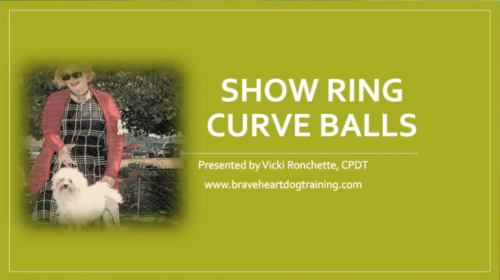 This webinar will focus on teaching your dog how to gait for the show ring, how to get the best movement from your dog, the different factors that affect gait and how to problem solve gait issues. 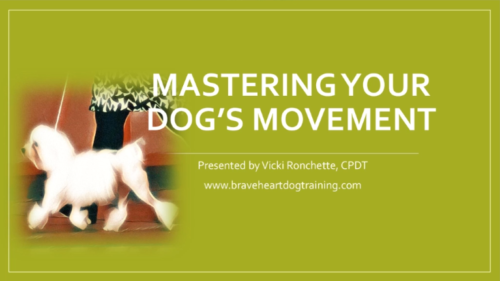 Whether your dog is pacing or simply not moving out or hasn't even been on a leash before, this webinar will teach you how to get your dog moving to the best of his ability! Are you new to the fancy? Are you completely new to dog shows and need a clear overview of how things work, what class to enter, what to wear and what to expect? Then this is the webinar for you. You will get all the information you need to be ring ready! Being fit is an important part of being a successful show dog. Learn how to increase your dog's strength, balance, body awareness and confidence with fitness training. Cavalettis, fitness equipment and non equipment exercises will all be discussed. 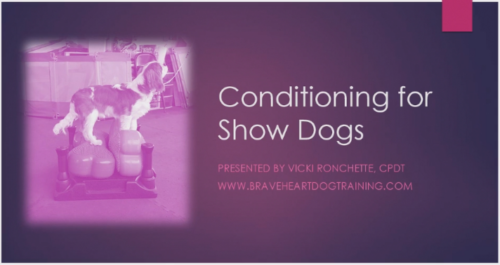 One of the best things about this webinar is that the exercises and information is not only useful for show dogs, it is beneficial to all dogs and is a great for mental stimulation and burning energy! This is a one hour webinar with a Q & A for attendees afterward.